Sunday night's Giants-Eagles game didn't need much more hype: It's a game that's been circled on calendars for weeks now, a chance for the Giants to prove themselves against one of the NFC's elite teams. The five-game winning streak that ended Sunday positioned the Giants as a contender in the NFC, but over the last six games they've ranged from great (versus Seattle) to good enough (versus Detroit) to not very good at all (versus Dallas, the second time). We've known for a while now that a win on Sunday, on the road in Philadelphia, would prove an awful lot. And then Monday night happened: Michael Vick turned in the game of his life, embarrassing the Redskins with some gaudy numbers and devastating at least one fantasy-football enthusiast. Suddenly, there was a storyline-within-a-storyline: "Can the Giants beat the Eagles?" 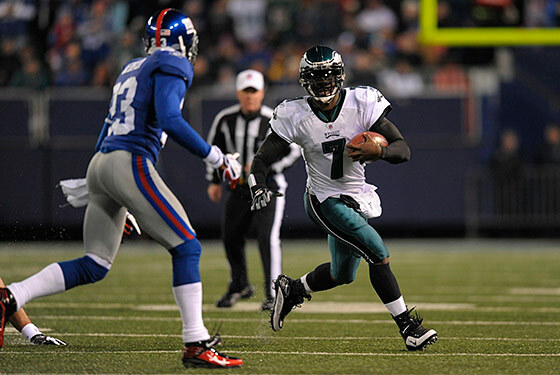 became "Can the Giants somehow slow down Michael Vick and beat the Eagles?" Not that the latter question hadn't been implied all along — at least since everyone forgot Kevin Kolb existed — but a historic mix of rushing and passing are sure to make your next opponent take special notice. For what it's worth, Perry Fewell says he has "a good plan in place." Of course, he had a plan in place against Peyton Manning too, and the Giants found themselves trailing 24–0 at the half. Needless to say, the Giants can't let the Eagles get off to that kind of start — especially since that 24–0 lead is nothing compared to the 35–0 advantage Philadelphia enjoyed nine seconds into the second quarter on Monday. Philly can put up points in a hurry. Philly has beaten the Giants four straight. And with the Giants' loss last Sunday, Philly enters the game with momentum. A Giants win Sunday might now prove even more than we'd previously thought.